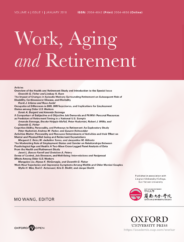 Work, Aging and Retirement provides a peer-reviewed forum for evidence-based, translational research on worker aging and retirement, with the goal of enhancing understanding of these phenomena. 1. The retirement process is more varied and complex than it used to be. Once upon a time, the typical worker would work until they reached their company’s traditional retirement age and qualified for their pension, and then they would leave work altogether and travel, spend more time with grandchildren, or pursue hobbies. Over the past decade, however, the retirement process, including decisions about whether and how to retire, have become increasingly complex. Greater numbers of workers are engaging in bridge employment, which could include transitioning to part-time work, or leaving one’s career job and seeking a different, often less demanding, type of work. Another phenomenon is unretirement, in which people are returning to work after retiring. Individuals may choose bridge employment or unretirement for a variety of reasons. For example, work can provide a sense of meaning and purpose, is a way to be socially engaged on a regular basis, and provide financial resources, whether it is wages, additional contributions to a retirement plan, employer-provided health insurance, or some combination, that makes returning to the labor force desirable. Research has found that gradually reducing one’s work hours may ease the psychological adjustment to retirement and may facilitate knowledge transfer between employees, but not all workers have the option to gradually reduce their work hours over time. Resting by Skitterphoto. CC0 public domain via Pixabay. 2. Many individuals are working longer (until a later age) or planning to work longer than they used to be. Overall, the global population is aging due to increasing longevity and decreasing fertility worldwide. In most industrialized countries and even some developing countries, the rapid growth in the size of the older population and the smaller number of younger workers is increasing the old-age dependency ratio. Some countries have responded to the growing old-age dependency ratio by increasing the age of eligibility for public pensions. Countries vary widely regarding retirement ages and the extent to which governments provide sources of retirement income to retirees. Extensive research has demonstrated that most people retire when the pensions become available. The main goal of increasing retirement ages and changing the earliest age of eligibility for pension funds is to extend the working lives of older adults, and in turn, relieve pressure on public budgets. To address the growing old age dependency ratio in the United States, Social Security policy has changed in recent years. Although the earliest age of eligibility for claiming Social Security retirement benefits remains at 62, the age for “full” benefits (which provides higher monthly payments compared to retirement claims at age 62) has been shifting from 65 to 67. 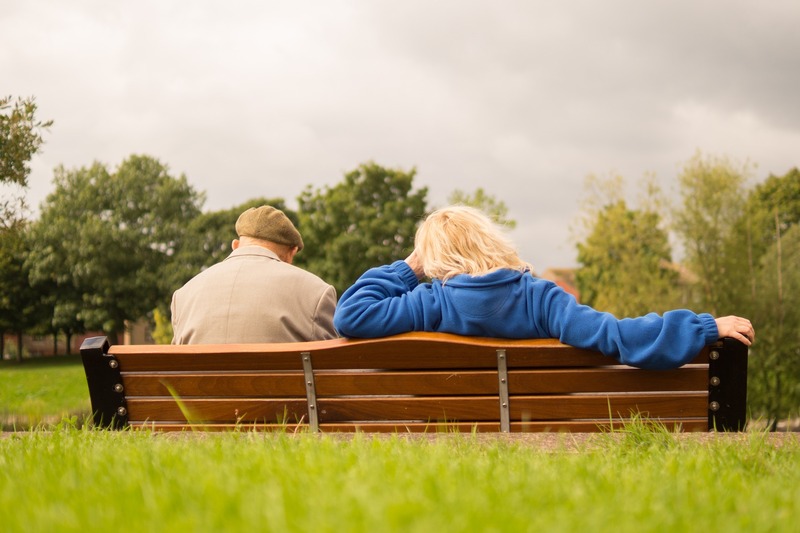 There are additional financial incentives to delay claiming benefits until age 70. 3. Now it is up to workers and retirees to save for retirement themselves and manage their wealth more than ever before. In the United States, the Social Security government pension program is not intended to be the sole source of retirement income for older adults. Retirement wealth typically comes from not only government pensions, but employer-provided pensions, private savings, real estate, and other assets. The vast majority of employer-provided pension plans have shifted away from defined benefit plans (which are typically based on years of service and salary) to defined contribution plans (in which employees and employers contribute money to investment funds, and the amount available during retirement depends on how much money is invested, for how long, and how the investments perform over time. It is never too soon to start saving. Past research from the Health and Retirement Study has identified that women, and particularly single, divorced, and Black/African American women are more vulnerable to economic challenges than men and married couples. This is because women tend to live longer than men, on average, and therefore need to finance a longer retirement without having the resources acquired by a dual-income household. 4. Our health status and work status are inextricably linked. Being able to continue working depends on our health, and the nature of our jobs and how long we continue working is related to health and well-being post-retirement. There is a growing body of research suggesting that continued work is associated with greater longevity and better physical health and cognitive functioning in older age. Featured image credit: Direction by geralt. CC0 public domain via Pixabay. Gwenith G. Fisher, Ph.D. is an Associate Professor in the Department of Psychology at Colorado State University, Adjunct Associate Professor in the Department of Environmental and Occupational Health in the Colorado School of Public Health, and Adjunct Research Professor in the Survey Research Center at the University of Michigan Institute for Social Research. Her expertise is in industrial/organizational psychology and occupational health psychology and her research investigates aging workforce issues, including health, well-being, and retirement. Prior to joining the faculty at Colorado State University in 2013, Gwen spent twelve years working on the Health and Retirement Study at the University of Michigan. Along with Dr. Lindsay H. Ryan, Gwen recently published the “Overview of the Health and Retirement Study and Introduction to the Special Issue” in Work, Aging and Retirement. Much of what we know about the retirement process in the United States is based on survey data gathered from the Health and Retirement Study (HRS), which is a biennial longitudinal study funded by the National Institute on Aging that began in 1992 and is still ongoing. To date the HRS has interviewed more than 43,000 individuals and produced almost 4000 journal articles, dissertations, books, book chapters, and reports. This special issue describes this study and highlights some of the latest research about work, health, and retirement. One thing I’ve never seen discussed, but that is the impact of Parkinson’s Law — “Work expands to fill the time allotted for it” — in retirement. With alll the things I’ve planned to do with my “extra time”, there never seems to be enough time to get most things done! after doing the math, giving a life expectancy of 82, it is most beneficial to retire at 70, the second highest total income was at the 62 level, then the standard 65-67. I retired at 59, I transitioned out by training my successor, the boss thought it would take 2 months, but it took over a year, because newer, younger people have different ideas about how the work should be done & product knowledge doesn’t matter so much as long as it’s in a computer. In our industry it isn’t.